Certified Translation Professional Program > More Qualifications, More Translation Projects. That is the Power of the CTP. Becoming certified can give you credibility when approaching new clients or applying for new projects. The CTP is a popular and respected online translation certification program in the industry. To complete this program you must pass our online examination, which tests your translation industry and language-specific knowledge. Our exam evaluates participants’ abilities to translate in both directions. For example, if you choose the English-Spanish language pair you will be tested on translating from English into Spanish as well as Spanish into English. 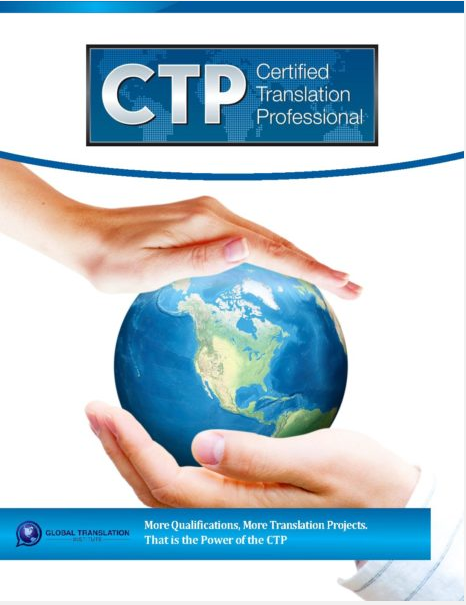 The CTP Designation Program is currently available for 22 language pairs. The language options are: English, French, Chinese (Mandarin), German, Italian, Russian, Spanish, Arabic, Portuguese, Bulgarian, Hungarian, Japanese, Greek, Korean, Polish, Dutch, Irish, Romanian, Hindi, Thai, Indonesian, Punjabi, and Danish.